Normally, being called two-faced by your customers would be alarming. 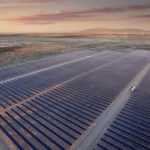 However, with the buzz of Intersolar North America focused on bifacial modules; being two-faced (or having a tracker optimized for bifacial modules) is a compliment for Array Technologies. Albedo – the amount of reflective light available, mainly determined by the site ground coverage. Module Height – the height of the tracker directly correlates to production gain. The higher the module is from the ground, the less shadowing effect and thus greater bifacial gain. However, there is a point of diminishing returns with taller tracker systems. Taller tracker systems have a much higher installation cost with larger foundations, increased labor and higher tracker and shipping prices. Backside Shading – the amount of shading that occurs on the back side of the bifacial module due to mounting gear. Backside Shading causes power loss, however the loss can be minimized with a variety of variables. 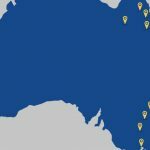 Tracker Algorithms – tracking algorithms that are specific to bifacial modules help boost ultimate production gain. Array Technologies’ optimized bifacial solution is the standard DuraTrack HZ V3 tracker system. The “One Module in Portrait” configuration of the DuraTrack is the optimal height to maximize production returns while minimizing installation costs. Additionally, the standard DuraTrack torque tube dimensions and distance from the bifacial module minimizes backside shading. Array is actively working with a national laboratory in New Mexico to continue testing bifacial performance with the DuraTrack system. Array had a functioning tracker within the booth, outfitted with a bifacial module demonstrating the tracker compatibility with bifacial. Needless to say, the tracker brought a lot of attention. Was it the Tracker or the Beer? 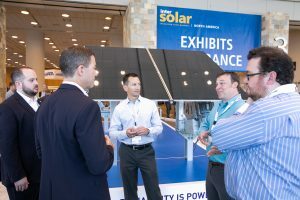 Any Intersolar attendee that ventured to the second floor lobby of Moscone West was sure to see the crowd around the Shoals booth. While many would suggest this was a result of free beer being poured, Array Technologies has another theory. A lot of the crowd could be found viewing the functioning Array Technologies tracker that was installed next to the bar. This tracker was also equipped with the Shoals Big Lead Assembly (BLA) and a CAB System. The Array tracker and Shoals BLA are an optimal technology combination for minimizing trenching and other costly labor associated with DC feeders. The combo offers a seamless solution for a site free of DC string combiners and no need for trenching since DC feeders are attached to the tracker via an above ground CAB System. 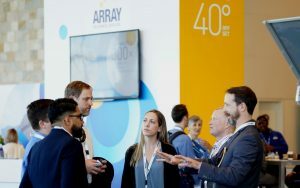 Both the Array Technologies and Shoal’s teams spent a lot of time at Intersolar working with customers on how to optimize system designs and layouts to take advantage of the cost savings available with an Array/Shoals system. In addition to bifacial modules and optimized tracker solutions, we spent a lot of our time discussing the solar industry’s maturation regarding trackers. 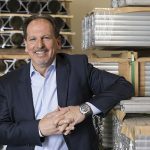 The days of buying the least expensive tracker are dwindling as long-term site owners realize that the cheapest tracker up-front can be exponentially costlier to own and operate.  The central tracker architecture developed by Array Technologies remains the most reliable tracker on the market with the lowest cost of ownership. Array’s system has 169 times fewer components in the field when compared to decentralized row trackers which require a battery and motor for every tracker row. Less components, fewer failures, more reliability with Array Technologies. 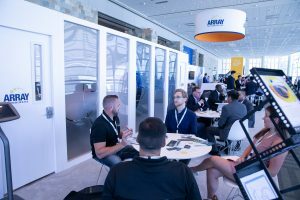 It was great seeing all of our colleagues, customers, and partners at Intersolar North America 2018. 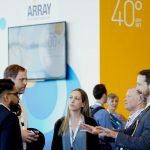 I have been attending Intersolar North America since its inception and I am still excited every year to see what the buzz will be in the ever-evolving solar industry.